As you gather your supplies, keep in mind that you can alter your star in any way to suit your own preferences. We used white spray paint, but you might opt for gold or green. And those little strings of Christmas lights come in clear and multicolored lights (we used clear). It’s all about the look that you want for your star. Enjoy the process! Make sure you have a well-ventilated area in which you’ll be working as the paint can have some strong fumes. 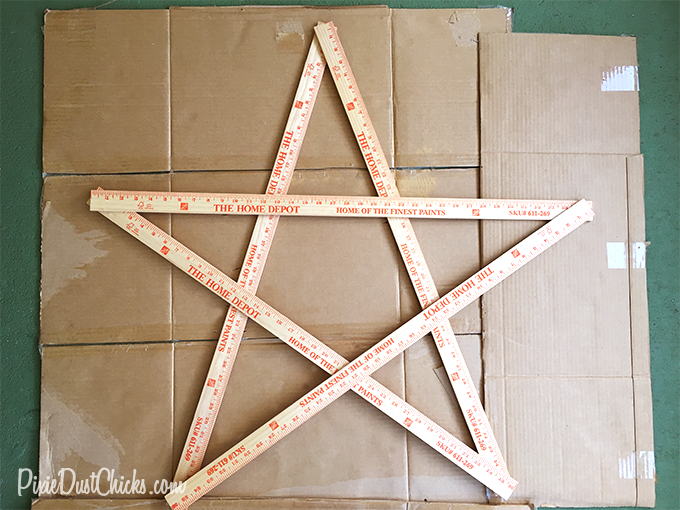 After you lay down your newspaper or cardboard (to protect your floor or grass if you’re outside), go ahead and lay down your yardsticks in a star pattern making sure the ends meet. 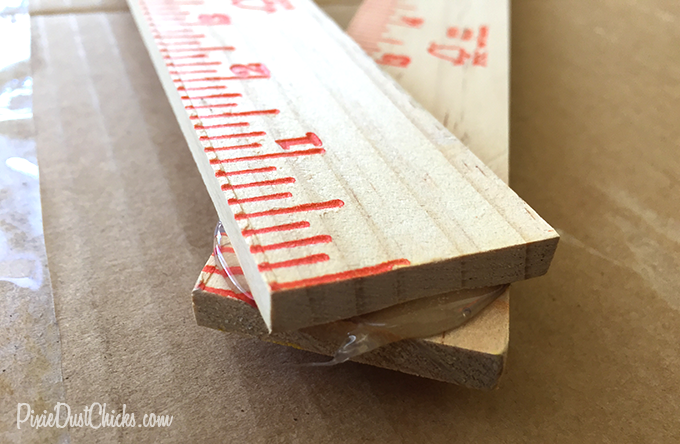 Next, take your already-plugged-in hot glue gun and squeeze a bit of hot glue in between each yardstick duo, making sure to then press and hold both pieces together for a few seconds. Please be very careful as hot glue can burn your skin. 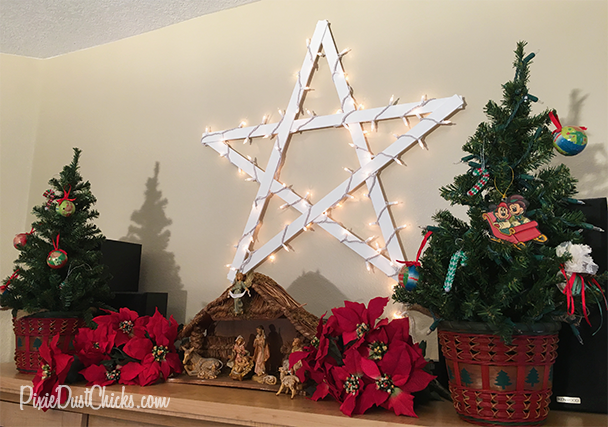 After glueing each end, be sure to hot glue the inside overlapping wood pieces (toward the center of the star) so your star is secure. Let the glue cool for a few minutes to set. 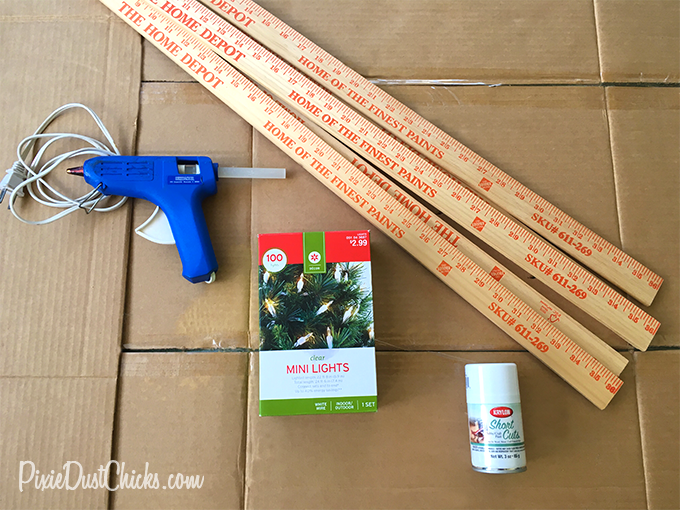 We didn’t do this, but instead of hot glue you can fasten the yardsticks together with a staple gun, hammer and nails, or wood glue. We found that hot glue worked well and fast. Now that your star is assembled, it’s time to paint. For this step, we moved outside to the yard. Read the directions on your can of spray paint as you’ll need to shake the can for several minutes to get everything mixed inside. 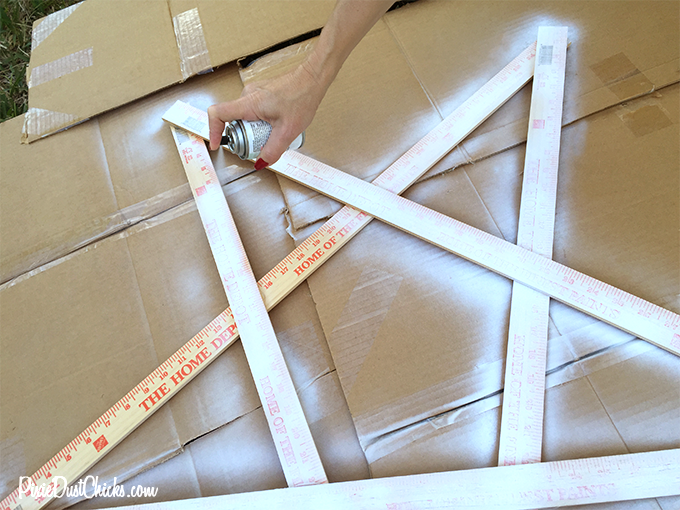 Holding the can about 10-14 inches away from your star, spray a light layer of paint making certain to keep the can moving. Let the paint layer dry for about 30 minutes then reapply paint. Several layers of paint are great because you want each layer to dry before applying the next, and you don’t want paint pooling or looking drippy. It takes a lot of patience to do light layers, we totally get that, but you’ll be happy you did it this way when you see the end result. Also be sure to paint the back. Once it’s dry to the touch, you can move the star somewhere where it can dry overnight. Okay, you’re almost done and you’re doing great! Now that the star is completely dry, it’s time for the lights. 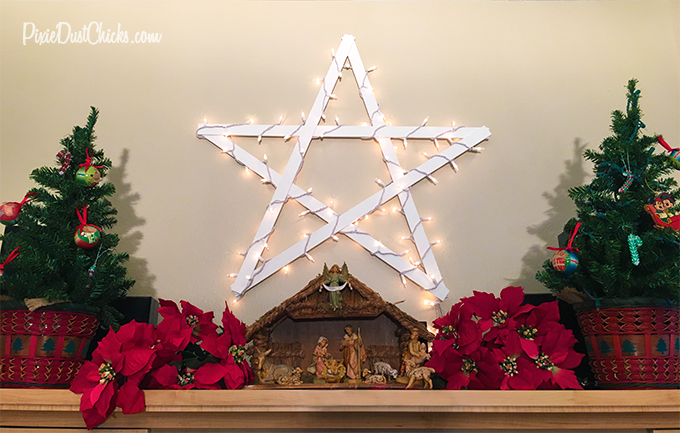 Wrap the lights around each part of the star, including the center of the star. We started at the bottom where the extension cord would plug in and then wrapped around from there covering every exposed piece of wood. If you like more lights, then get two strings and wrap the lights closer. Finally, we used penny nails and a hammer to hang our star. Then just plug in the lights and voilá! You have your own lighted Christmas star that you made! We’d love to see your stars! If you’d like to share it, tag us on Twitter or Instagram! !